Bloggers have always amazed me. Great bloggers are thoughtful and reflective; consistent, creative, and clear. They are confident and courageous – ready and willing to take the leap of faith that learning in the open necessitates. 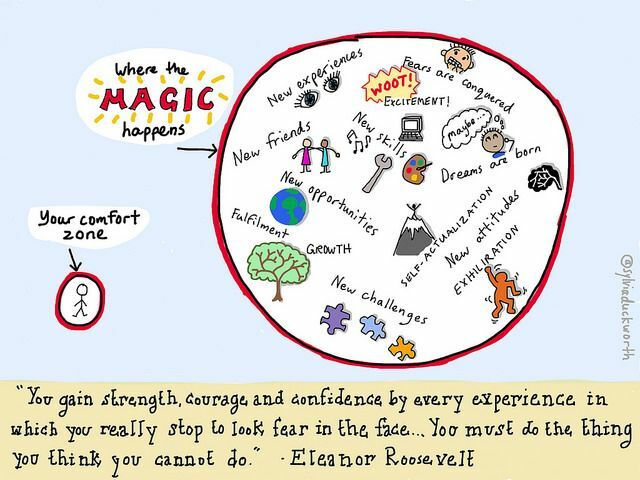 I love this image by @sylviaduckworth illustrating the MAGIC that happens when we (learners) step out of our comfort zone. The image sparks something in me – it makes me want to be there – outside of comfort – in a new space of magic where preconceived notions are challenged, where fears are faced, and connections are made. So – as new and daunting as it may be, today I join you, superhero bloggers. Today I move from consumer to creator. From participant to contributor. Today I don my cape and step into the great unknown. Words won’t always come easily for me, and I won’t be an expert in all things. My work won’t be perfect and I won’t always have the answers. But I will be thoughtful and reflective. I will push the limits of my comfort zone. I will contribute. I will be BRAVE.